About this time last year, I noticed a turtle in my front yard. It wasn’t crawling from one point to another, but had chosen a sunny spot on a hillside to hang out. Turns out it was a female slider who’d found a place to lay her eggs. After she left, I placed a beach chair over the muddy hole she’d scraped out so the nest wouldn’t fall victim to the lawn mower. I don’t know whether she actually laid eggs or if they hatched or whether the baby turtles made it to City Lake, which is about 100 yards away, but I hope so. Now it’s happened again. On Memorial Day, I spotted a turtle near the very same place in my yard. Again, she seemed to be settled in. Again, I was eager to play a part in helping her efforts succeed. The turtle stayed in the same spot for several hours. When she was gone, I studied what she’d left behind. This nest was a little different. In addition to a shallow muddy hole, the nest had a narrow tunnel in it. At the entrance to the tunnel were three broken eggs, their contents spilled on the ground. Did this mean there would be no babies? Or had the mama turtle deposited additional eggs deep in the tunnel? How many eggs does a turtle lay? How many of those eggs actually hatch? How many of the hatchlings make it to safety? And what could I do to help? Alas, I found no sure answers on the internet. Most of the information I came across dealt with the reproductive habits and needs of pet turtles, including how to determine if eggs are fertile and how to use an incubator. No use to me. Perhaps, I thought, I should just let nature take its course and not try to protect the babies. If they were crushed by the mower or eaten by predators or drowned in a heavy rainstorm, that’s life. Survival of the fittest and all that. Obviously, slider turtles aren’t endangered. All you have to do is notice how many are basking on top of each other on logs in the lake to know they’ve got this perpetuation of the species thing figured out. Probably, the best thing to do was leave this nest alone, but somehow I just couldn’t. I dragged a plastic milk crate out of my garage and placed it over the tunnel. 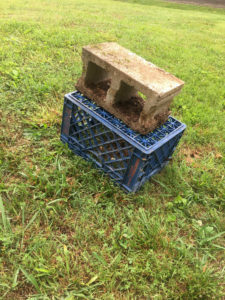 Then I put a concrete block on top of the crate, hoping it would be heavy enough that even the most ambitious raccoon couldn’t budge it. Now I’ll wait. In a couple of months, the baby turtles will be ready to use their egg teeth to chew their way out of the shells. That’s when I’ll remove the fortress. Maybe this year I’ll be lucky enough to witness their journey to City Lake. Fingers crossed.